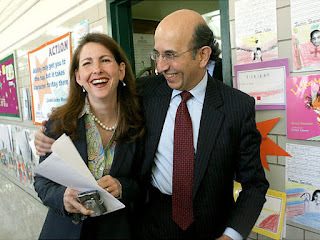 In yet another piece about its favorite subject, Eva Moskowitz, Chalkbeat runs Eva's answer to her critics. Fortunately for Eva, nothing she does is ever wrong and it doesn't matter at all that she's managed to leave behind 78% of her students. Also, in a single year she's managed to shed most of her high school teachers, with over 2 of 3 moving to greener pastures. This also makes no difference whatsoever. Despite this, for some reason Eva felt the need to write the parents. It's disappointing to lose your favorite teacher. However, some did not quit out of desperation. Some were not fired for what we call incompetence, and what other people call inability to work 20 hour days or have a life. And if they were incompetent, and we hired them, it's not our fault. After all, nothing is. You see, at Moskowitz Academies the important thing is to give the very best quality education. Evidently you do that by shedding all the losers who don't measure up. It's not our fault if your kids are losers. After all, dumping losers is how many charter schools manage to get those incredible 100% 4-year-college admissions. You'd better believe anyone who didn't make it to that four year college didn't make it out of the four year high school either. So this, evidently, is how you make miracles. This is how you trod all over a public school system, grasping and taking whatever you wish, displacing neighborhood children, stealing libraries, and keeping your noses so far up in the air that a good rain would drown you instantly. The other part of the miracle, of course, is an educational leader who's willing to play ball. For a long time, that was Mike Bloomberg, who tolerated Joel Klein's hot line to Eva. When Bloomberg left City Hall to try to buy his way into becoming President of the United States, Andrew Cuomo grabbed the mantle, stood with Eva in Albany, and made it impossible for Bill de Blasio to oppose charters without paying their rent. And there were all the miracle stories. They passed the test. They had higher percentages than those crappy public schools. It was a civil rights issue. Eva herself echoed GW Bush, speaking of "the soft bigotry of low expectations," in her letter to parents. Evidently, it does not occur to Eva Moskowitz that a 22% graduation rate is an indication of abysmally low expectations. It appears to me that Moskowitz Academies take no responsibility whatsoever for their students. Were they really running on the magic they claim, they'd graduate 100% of their students. There would be no "got to go" lists. Last year I had terrible troubles with some of my students. I had a class of 34, par for the course in Fun City. Yet several of them were not keeping up. There were various reasons for this, the most common of which was that the students were SIFE, or students with interrupted formal education. This could easily mean the students had not been in schools in their native countries in years, if at all. Ask me how many SIFE students are in Moskowitz Academies. Ask me how many beginning English language learners are in Moskowitz Academies. Anyway, I had seven students who could not keep up, seven students who'd certainly have failed. Despite the proven wisdom of Moskowitz Academies, we did not write up a "got to go" list. We did not call up the parents and ask them to move their kids elsewhere. In fact, we didn't even make them sit and do test prep until they peed their pants. What we did was find an empty classroom, a minor miracle in itself for us. It was a very small room, but that was okay because we only had seven students. I taught the class, took all the kids back to square one, and moved very slowly. I gave fewer tests than I usually do, but I spent a lot of time making sure these kids knew material well before doing so. And rather than drill them to death, I was consistently kind to them. Every one of those students passed that class. Several thanked me for giving them a class they could understand and follow, unlike others they were taking. I could have taken the approach Moskowitz seems to favor, judging from her letter. Hey, it's a tough world, so you just have to do whatever I force you to do. That's the only way to prep you for college, which is going to be even worse. This, of course, is to prepare you for life, which is going to be even more miserable. Here's the thing--even though Moskowitz musters the temerity to label her test prep factories "success academies," they fail four out of five who enter. This is nothing to boast about. The papers can praise them in editorials from now until doomsday, but the fact is we public schools, even the ones closed by the city, have better records than Moskowitz. I, for one, value academic achievement. Nonetheless I'd rather see my own kid, and probably every kid I know, fail in a public school than be tortured in a Moskowitz Academy.